As you know, we have now entered the new tax year, which is always a good time to focus on your investment portfolio and options. As you will also be aware, stock markets have become more challenging in the last year or so, after a decade in which investors enjoyed strong returns, that were relatively easily achieved – as governments around the world supported their economies with ultra-low interest rates, quantitative easing, leading to easy money supply. For various reasons, which we explain in this email, we think now might therefore be a good time for investors to consider including ‘best of breed’ structured products in their portfolios. With that in mind this email therefore includes details of a new structured product firm, offering two plans that we would like to bring to your attention, for you to consider. I am also pleased to highlight a Best Price ‘New Tax Year: 10 Day Special Offer’, which provides discounted advice services for investors, in connection with the Tempo product suite, at a cost of just 1%, if you invest in any of Tempo’s products prior to the offer period close date of Thursday 18th April. Despite some criticisms in the past, in recent years, some interesting statistics about structured product performance have been emerging, including comparisons to mutual fund performance. The above statistics do not compare apples with apples, as the mutual fund performance is looked at over just the one year, while many of the structured products that matured over the year will have run for longer than just one year. However, the general point is that 2018 was clearly a challenging year for mutual funds, after a long period of positive returns for much of the previous decade, which served many investors extremely well. In contrast, it was a strong year for structured products, following several years when their performance has notably improved, following significant improvements in the approach of the sector. Additional performance statistics comparing structured products to mutual funds have also just been released by a specialist independent research provider, Future Value Consultants (‘FVC’). FVC has been providing independent research for professional advisers on UK structured products since 1999. In that time, it has produced research reports on more than 5,000 structured products. 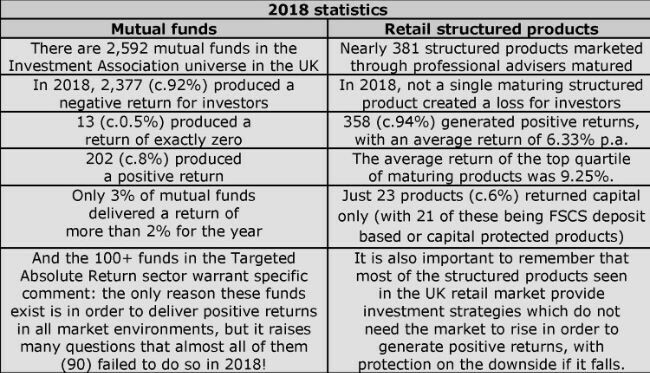 As FVC rightly suggests, it would be difficult, if not impossible, to find any other area of the investment universe that could make a similar claim: that NONE of its propositions lost money for investors in the last 3 years (in fact as the first table above shows, 92% of mutual funds lost money for investors in 2018). The factual evidence of the efficacy of structured products and their ability to potentially add value in diversified and balanced portfolios, especially in a challenging market environment, is clear and incontrovertible. Such performance analysis should be highly compelling for investors, regarding the virtues and potential benefits of including structured products in portfolios. An important point, that we have been making for some time now, is that we think investors should be carefully considering the possibility that we could be at an inflection point in stock markets, and that it may be much harder to make such strong returns in the decade ahead of us as were enjoyed in the decade now behind us. In our view, a more challenging market environment favours including structured product strategies in properly diversified portfolios. In fact, we would suggest that it is hard to identify investment funds or products that may be better suited to the current and foreseeable investment environment than ‘best of breed’ structured products: as they offer strategies which do not need the market to rise in order to generate positive returns, with protection on the downside if it falls. Generally, our approach to our clients is that diversification is key, or as grandma used to say, ‘Don’t put all of your eggs in one basket’. This has always been sound advice for investors to remember. But in addition to diversifying across different markets / geographical regions (such as the UK, Europe, the US, Asia, etc.) and different asset classes (such as equities, bonds, property, etc. ), we also think that investors should consider diversifying across different types of investment, in other words using ‘best of breed’ mutual funds, both actively managed and passive, along with ‘best of breed’ structured products (including structured deposits), to achieve better diversified and more balanced portfolios (which Best Price FS do with our risk based investment models). A recent entrant to the structured products industry in the UK is a new plan manager called Tempo Structured Products. The firm has been established by a team that includes individuals who have been at the forefront of the structured products sector in the UK since its earliest days, who have been extremely well-backed by a substantive parent company with the aim of doing things differently, to ‘raise the bar’ in structured products. We really like their approach, including their focus on investment integrity, defensive investment products and exemplary service and support for advisers and their clients. We also like the fact that Tempo only allow their products to be invested in via authorised and regulated investment firms providing advice about suitability to investors. We have attached the brochures for two Tempo plans, which we believe offer exceptional terms and risk/return profiles. The Tempo Long Kick-Out Plan offers the best terms in the market, for comparable kick-out products. 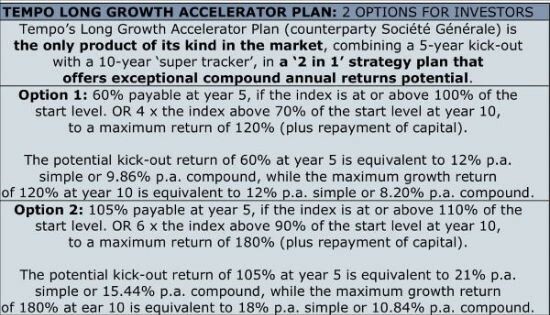 Simply put, we can’t think of any other investment fund or product that we reasonably think would be more likely to deliver such strong compound returns, with a defensive risk/return profile, as this innovative Long Growth Accelerator Plan. We think it offers a great strategy for investors to consider as a longer term, core holding within portfolios (including for those clients who already have a kick-out structured product). One of the key points that we like about Tempo’s approach is that ALL of its products are ‘deliberately defensive’, which means that they are all designed so that they can generate some or all of their returns without requiring the market to rise, with a defined level of protection should the investment fall, related to the plan in question. Tempo also offers investors options within each of its plan, which is an approach that we really like, as we think all of the options have merit, and we fundamentally like offering investors the potential to diversify, even within a simple, single ISA. As always, and especially as we have drawn your attention to past performance statistics, we must make the important and sensible regulatory statement: past performance is not a guide to future performance and should not be relied on, especially in isolation. The value of all investments, including structured products and mutual funds, can fall as well as rise. As with all forms of investment there are risks involved with structured products. These plans do not guarantee to repay the money invested. The repayment of money invested at maturity may also depend on the closing level of the relevant index on the end date, with the potential for loss of capital if the index closes below the percentage of the start level that any protection barrier is set at. For example, if the barrier is set at 60% of the start level, and index has fallen by 45%, the repayment of money invested will be reduced by 45% (meaning that investors will get 55% of their investment back). We are very careful to explain the risks just as clearly as the benefits of structured products – and we provide extensive information to help investors understand these risks in detail. Please ensure that you read the plan documents for full details of the features and risks. The offer period for the Tempo plans closes on Thursday 18 April (unless it closes early, as some plans recently have). If you would like to find out more about the Tempo plans, and discuss whether an investment may be suitable for your personal circumstances, please contact us.